Residents of the East Coast and beyond awoke to terrifying news on Tuesday morning: According to a push alert issued at approximately 8:30am, a tsunami was barreling toward the coastal regions of various states, including Maine, South Carolina, Massachusetts, Connecticut, New York, and Texas, among others. Except there wasn't any kind of natural disaster afoot. In an episode similar to the false missile alert issued in Hawaii last month, the National Weather Service caused a mild panic by sending out a test tsunami warning without clearly marking the alert as a drill. The NWS advisory buried the fact that it was a test -- users apparently had to open the alert to see the full message -- so naturally, visions of a biblical wave sweeping away homes and lives ensued. Users of the private weather service Accuweather seemed to fair worst in the snafu. While the NSW alert did technically characterize the event as a "test," Accuweather pushed the warning out as if a real tsunami was brewing. And now the Great Texas Tsunami of 2018. Everyone on the entire east coast of the US gets a Tsunami Warning instead of a test message. 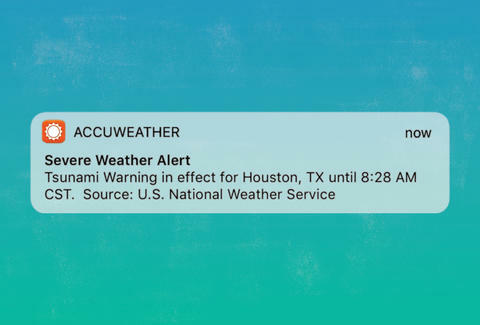 "This morning AccuWeather passed on a National Weather Service Tsunami Warning that was intended by the NWS to be a test but was miscoded by the NWS as a real warning. AccuWeather has the most sophisticated system for passing on NWS tsunami warnings based on a complete computer scan of the codes used by the NWS. While the words "TEST" were in the header, the actual codes read by computers used coding for real warning, indicating it was a real warning," the agency wrote.